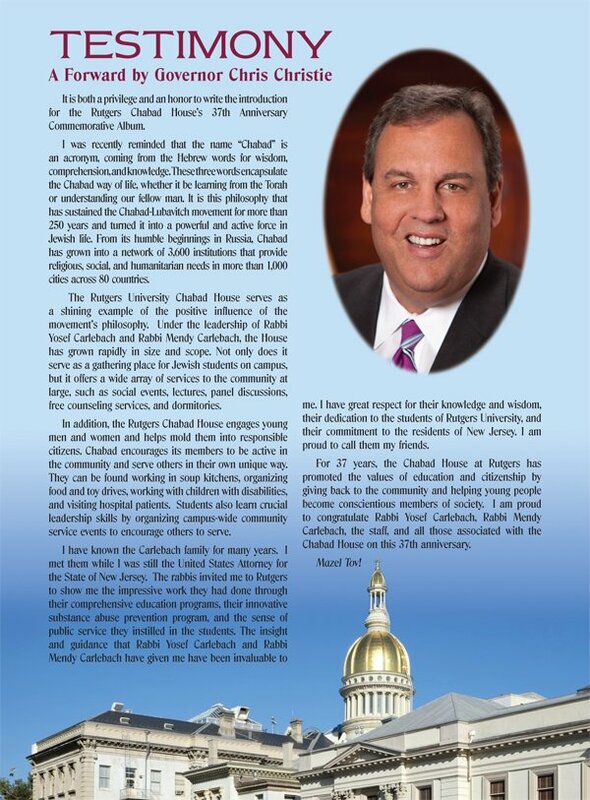 Testimony by Governor Christie In honor of the 37th Anniversary of the founding of Chabad House at Rutgers University, Chabad has recently published a 204 page coffee-table pictorial album. 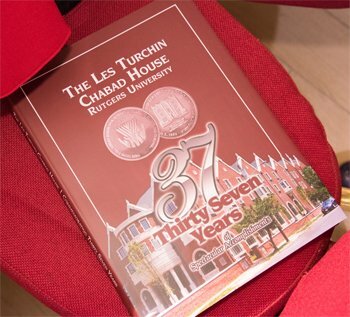 This book is complete with the history of Chabad House, from its humble beginning in a rented room to its present day location in the heart of the Rutgers Campus. Colorful stories and photos depict all aspects of the Chabad House and its outreach activities at Rutgers, and throughout New Jersey. We are proud to present you with excerpts from this magnificent historical account of how the largest Chabad House in the world was founded and nurtured by rabbis, community leaders, and supporters. I was recently reminded that the name “Chabad” is an acronym, coming from the Hebrew words for wisdom, comprehension, and knowledge. These three words encapsulate the Chabad way of life, whether it be learning from the Torah or understanding our fellow man. It is this philosophy that has sustained the Chabad-Lubavitch movement for more than 250 years and turned it into a powerful and active force in Jewish life. From its humble beginnings in Russia, Chabad has grown into a network of 3,600 institutions that provide religious, social, and humanitarian needs in more than 1,000 cities across 80 countries. The Rutgers University Chabad House serves as a shining example of the positive influence of the movement’s philosophy. Under the leadership of Rabbi Yosef Carlebach and Rabbi Mendy Carlebach, the House has grown rapidly in size and scope. Not only does it serve as a gathering place for Jewish students on campus, but it offers a wide array of services to the community at large, such as social events, lectures, panel discussions, free counseling services, and dormitories. In addition, the Rutgers Chabad House engages young men and women and helps mold them into responsible citizens. Chabad encourages its members to be active in the community and serve others in their own unique way. They can be found working in soup kitchens, organizing food and toy drives, working with children with disabilities, and visiting hospital patients. Students also learn crucial leadership skills by organizing campus-wide community service events to encourage others to serve. I have known the Carlebach family for many years. I met them while I was still the United States Attorney for the State of New Jersey. The rabbis invited me to Rutgers to show me the impressive work they had done through their comprehensive education programs, their innovative substance abuse prevention program, and the sense of public service they instilled in the students. The insight and guidance that Rabbi Yosef Carlebach and Rabbi Mendy Carlebach have given me have been invaluable to me. I have great respect for their knowledge and wisdom, their dedication to the students of Rutgers University, and their commitment to the residents of New Jersey. I am proud to call them my friends. For 37 years, the Chabad House at Rutgers has promoted the values of education and citizenship by giving back to the community and helping young people become conscientious members of society. I am proud to congratulate Rabbi Yosef Carlebach, Rabbi Mendy Carlebach, the staff, and all those associated with the Chabad House on this 37th anniversary.